« How to Have a Successful Marriage ~ Tips from a Couple Who Partners in Both Love and Business! Howdy Texas Gals! Couldn’t You Use a Well-Deserved Girls’ Night Out? Enter to Win One Now! Speaking as a busy mom, I love the chance to break away from the tension that comes with running a household to enjoy a little quality fun time with my friends. It's so important to recharge your batteries and relax a bit with your best gal pals so that you can go back to being the best wife and mother possible. 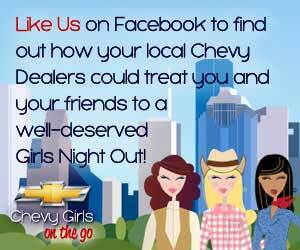 The folks at Gotta Love Chevy Houston understand how important a girls' night out can be and they're sponsoring the opportunity to win a fun-filled getaway each week. Head over to their Facebook page, click on the "WIN a Night Out!" button and maybe you might be the lucky one to nab one of the following terrific prizes. Howdy Pardner! It’s Stick ‘Em Up Friday for May 11th ~ List All Your Giveaways Here!